I have a soft spot for pastries, specifically croissants. I'm always on the lookout for croissants and lately I've been taking every opportunity to order it whenever I see it on a menu. After a late night or rather, early morning from having a few people over at my friend's place in SF, we dragged ourselves out of bed in search of nourishment and for some hair of the dog. 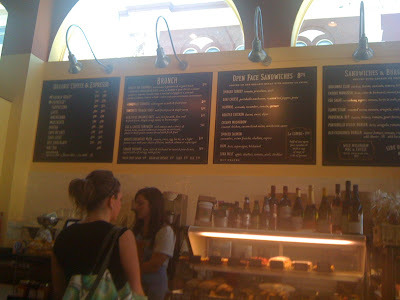 When faced with a few brunch options, I automatically decided on a neighborhood French bakery that has locations around town. 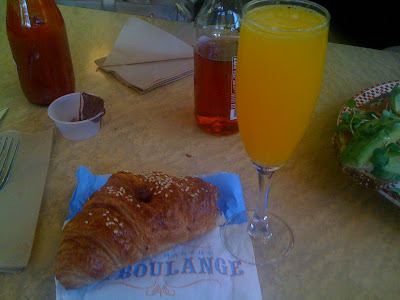 La Boulange bakes their pastries and bread daily so it was the perfect place to help further my croissant research. You order at the counter, take a number and grab a seat at this busy joint. I tried to be healthy with the wheat croissant but honestly it didn't work for me. It lacked that buttery taste that you expect from a croissant. It tasted exactly like what you would think wheat tasted like. There's a reason why it's "healthy", it's not supposed to taste that great. Portion was pretty small as I was starting to regret my order. But it was really rich. The french toast was piping hot inside. It was a bit mushy and spongy inside. It felt like a cross between a bread pudding and a souffle. It definitely wasn't a toast consistency like a regular french toast. 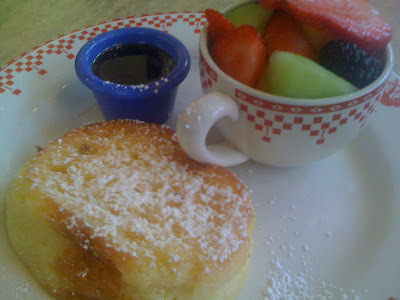 A french toast also traditionally has an egg coating but it didn't appear to be present in this version,either that, it was a very thin layer. It wasn't bad. Just unexpected and a bit too sweet. I think it belonged in a dessert menu. 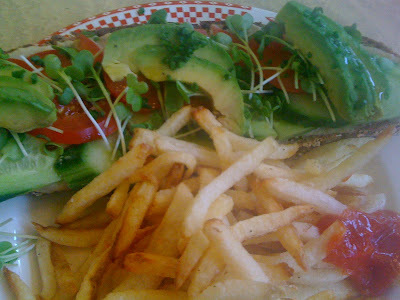 Hummus sandwich with avocado, cucumber, tomatoes, sprouts served on organic bread and fries. This was pretty healthy and very Cali sandwich. The ingredients were fresh and tasty but I don't think this was anything special. 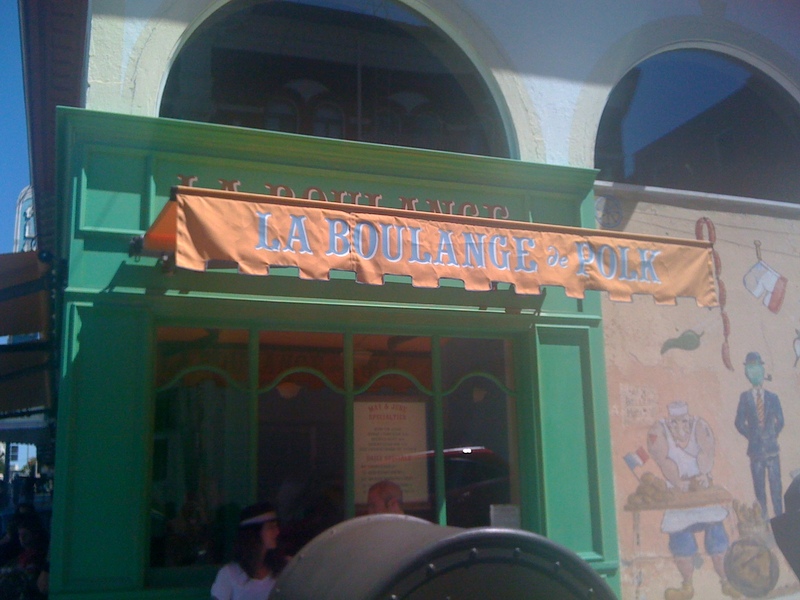 The next day when I went in search of coffee, I once again landed at La Boulange. There was a canele that was calling my name the day before. 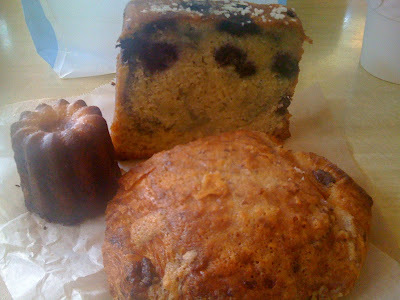 It's hard to pick just one pastry so I ended up with the canele, blueberry pound cake and a chocolate croissant. The canele was everything that I hoped for. It had a nice dark caramelized exterior and was soft and semi-custardy yet airy inside. The blueberry poundcake was buttery and so tasty that you knew it would cost you a considerable amount of calories. Even the wax paper that wrapped the cake got oily. This croissant was much better than the wheat croissant from the day before. Sometimes, it's just worth the extra calories! I've thought about it, and after many visits due to convenience, I'm convinced this is an average chain bakery.